Water shortages will soon lead to increasing political instability, displacement of populations, and, more likely than not, political unrest and war. Now, it’s time to come together and find the sustainable solution to avert water crisis in the world. Many companies around the world are trying to improve the quality of water or generate water from the ocean or river using innovative technology solution. Watly is an integrated utility machine that desalinates and purifies water, provides free electricity, and allows Internet connectivity, by exclusively harvesting solar energy. It purifies up to 3 million liters of water per year and could service a community of up to 3,000 people. The project is designed to solve three major weaknesses in infrastructure all at once: access to water, electricity and internet. Across the world, 783 million people do not have access to clean water, 1.2 billion lack accesses to electricity, and 4.2 billion are still without internet access. 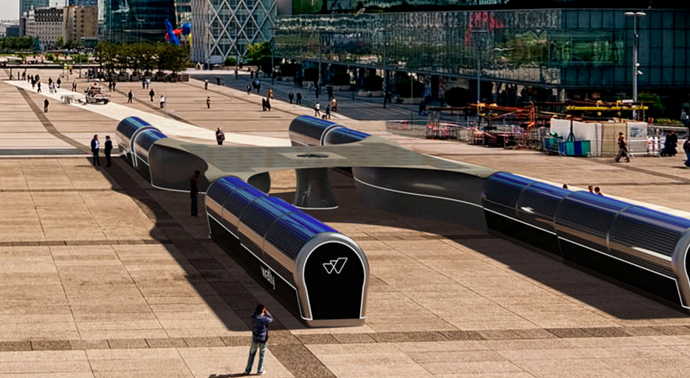 It recycles polluted water into a drinkable quality, it has many ports where you can charge your devices, it has a 3D printer and it also lets you connect to the Internet—all of this is powered by a built-in Solar Panel. Watly's operational lifespan is of +10 years, even in the harshest environmental working conditions. Its distillation method is 11 times more efficient than traditional distillation processes. Numerous 160 m2 of solar thermal vacuum tube panels provide the thermal energy that is needed to run the process of water distillation. Watly’s thermal panels are super-efficient and extremely resistant. 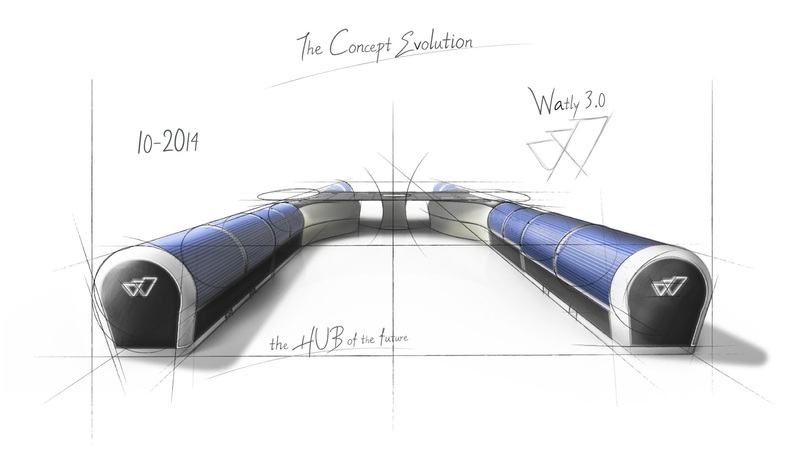 Watly’s unique "arch shape" allows the thermal tubes to be optimally exposed to incident solar irradiation during the whole day. The solution emulates the advantages of a moving sun-tracker but is extremely simple and reliable in the long term. Its long legs are wrapped in an array of photovoltaic cells that generate enough electricity to make the entire structure self-sufficient. On top of the central unit is a solar roof with its array of 40 mono-crystalline photovoltaic panels. It has a nominal power of 10 kW and generates up to 70 kWh/day. Such an outstanding performance is obtained by maintaining the photovoltaic panels at optimal working temperature even under the hottest sunny days. It uses the physical principle called vapor compression distillation. It is by far the most effective and powerful method of water purification and desalination available. In terms of efficacy, it outperforms reverse osmosis, nano-filtration or ultraviolet purification methods. Watly water quality is outstanding, absolutely pure, low mineralized and with a perfect pH balance (6.8 - 7.2). Water quality remains constant over the +15 years of Watly’s lifespan. During its 15 years of service, one Watly can reduce as much as 2000 tons of greenhouse gas emissions (CO2), which is equivalent to 5000 barrels of oil. Watly also aims to reduce as much as possible the carbon footprint “during” the production phase of its devices. It efficiently desalinates ocean water, eliminates all pathogens and microorganisms from previously polluted water, including: viruses, bacteria, parasites, fungi or cysts. It removes inorganic compounds as well as poisons: arsenic, benzene, heavy metals (such as lead), chlorine, chloramines, and radionuclides. It purifies water from any organic compounds and liquid contents of latrines. It does not need membranes or filter substitutions. It even purifies radioactive water. 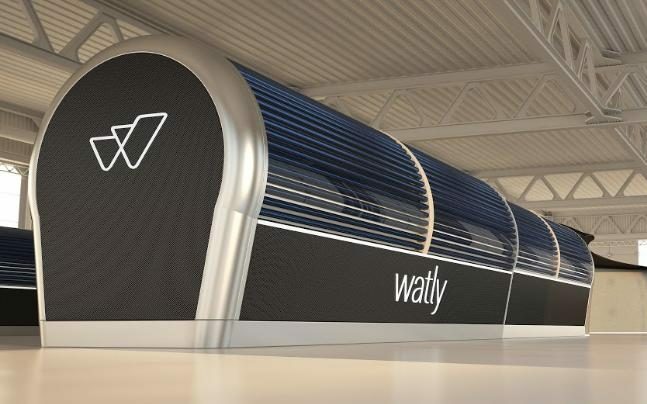 Watly’s patented heat exchanger technology makes possible for the photovoltaic panels to work at their optimal nominal operating cell temperature of 25ºC, even with outside temperatures of 50–90ºC. Working at lower temperatures increases panel efficiency by 40–50%. Watly is developing the W-Tank, a 5L plastic water tank for personal usage. They will deliver one to each individual. Watly automatically refills this tanks when inserted in the machine by its owner, they can track the usage through its internal RFID chip.